What to do when you travel across the country for a month and assessment is 2 months away? 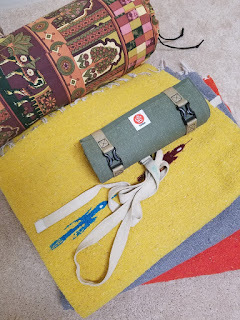 Take a travel yoga mat, 3 nice thick Mexican blankets- can't skimp on those (4 is standard but I can make due with 3), a traditional 6 ft Iyengar belt and order an inflatable bolster to meet you there. I ran out of room for a yoga brick. But it works. Now if only my daughter would let me do yoga every night. Last few nights she wanted to cuddle, I think she is having trouble breathing, allergies or croup, but how can I turn down cuddling- so my yoga last few nights were spent snuggling with my sweet daughter and making sure that she is alright.